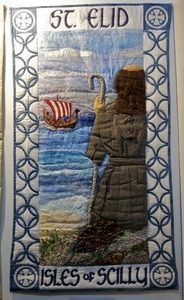 In 2012 Mary Miller, a quilter from Falmouth, had the idea to put together an exhibition, in our lovely Truro Cathedral, to celebrate the lives of some of our Cornish Saints. From the Isles of Scilly to Bude and from Launceston to Zennor quilters, embroiderers and textile artists took up the challenge. With the help of Jo Morgan, Helen Edmond and Di Wells, Mary’s vision became a reality and the exhibition opened on June 30 2014. 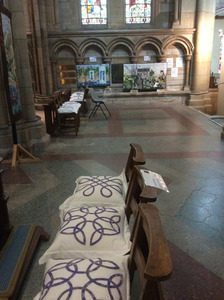 Just walking into the exhibition was stunning with thirty five quilts, two beautifully stitched Celtic Crosses and eighteen hand appliquéd Celtic cushions. The quilts themselves were displayed on the walls behind and to the side of the High Altar and were arranged in the order of each Saint’s Feast Day. Looking around the exhibition before I was due to start stewarding I was staggered not only by the range of techniques on display but also by the imagery used to depict the lives of the Saints. 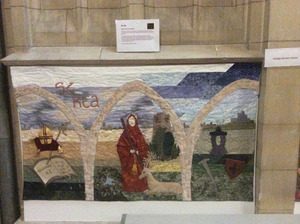 The quilt depicting the life of St Mewan was made by the St Mewan Banner Group (see Photo 1). The first thing that struck me (and others going around the exhibition) was the ghostly white figure of St Mewan in the foreground of the landscape. The group said they represented him in this way to show how his spirit pervades the whole area. We can just see the white clay “pyramids” with the sea, the well (which he is said to have used) and the church in the background. 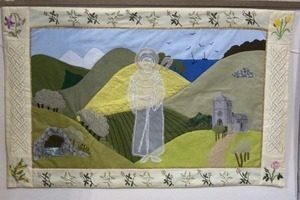 Karenza Quilters represented the life of St Ke, (Photo 2) who became a hermit living in Kea (named after him) where he built a small church and was known for his acts of kindness. The quilt is divided by three arches (inspired by the internal architecture of Kea Church) representing different stages of his life …from being a bishop to becoming a monk and hermit and the third arch depicting a knight’s attire as he was reputed to have served at the court of King Arthur. One quilt, which really caught my eye, was one made on the Isles of Scilly by the Lyonesse Quilters and Stitchers (Photo 3). The saint depicted was St Elid. He was a member of the Cornish monastic order of Syllanines who ruled the Isles of Scilly for several centuries. A Norwegian king is said to have been converted by St Elid in the 10c …hence the Viking ship. Many hundreds of people saw the quilts over the two week period and the visitor’s book was full of praise for the standard of workmanship. While I was stewarding I spoke to visitors from Eastern Europe, Australia, France and Germany as well as those from the UK (and I was only there for a few hours). All seemed captivated by the different techniques, designs and also by the imagination of the stitchers to produce such amazing works of art! One, which was completely different in every way, was designed and made by Susan Rescorla. 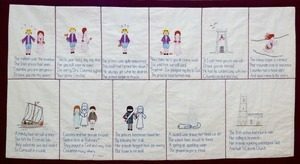 As she said “ St Columba’s story is full of action so I decided to use the medium of the action stories of today – the comic strip. Hopefully the truly dreadful verses will entertain and encourage a visit to St Columb Major” (Photo 4). I saw so many people stop, examine the wording on the quilt and give a little chuckle at this one! Finally just to mention the Celtic theme of the exhibition. There were two beautiful Celtic Crosses. 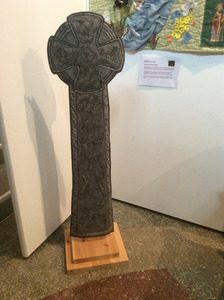 One, adapted from a Celtic cross in the very old cemetery in Liskeard was made by Betty Swindley and hung at the entrance to the exhibition (Photo 5) and the other by Lyn Carr was inspired by a cross, a memorial to sailors lost at sea, which is in the churchyard at Morwenstowe (Photo 6). Two groups of quilters from Truro, Friendship and Riverview Quilters, made eighteen cushions with Celtic motifs’ using a beautiful blue batik for the appliqué and a white background for the cushion covers. (Photo 7) These were displayed on seats throughout the exhibition area. 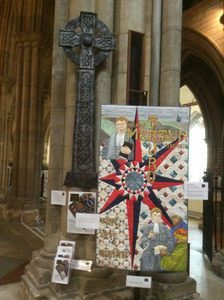 The quilts and crosses will be travelling in 2015 with Grosvenor Exhibitions so that people all over the country will get the chance to see our “Saints of Cornish Churches”.